Nice banners. You're on Team Stark. What fun! And where did you get the Margery one? I didn't think she'd appeared yet on Season 1. Don't tell me Season 2 has started up and I'm missing it. 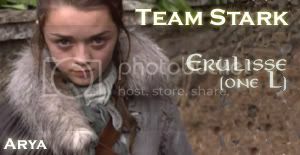 I'm on Team Stark, Oshun is on Team Lannister, and we're both losing regularly to Team Targaryn - LOL.